Through her tenure at Signature Science LLC, Mary Heaton had seen the company’s portfolio of DNA applications grow hand-in-hand with the power of genetic technologies. Founded in 2001, Signature Science is engaged in the collection, analysis, and interpretation of DNA data for use in personal identification, including applications in homeland security, public safety, criminal justice and other elements of law enforcement. As genetic analysis has rapidly become the most reliable tool in personal identification, Signature Science’s Forensic DNA Laboratory has grown in tune. But Heaton also grew aware of practical limitations to the use of DNA evidence. In the path from collection in the field to processing in the lab, samples could get degraded, contaminated, or simply mixed up. These risks grew greater with increasing distance to the lab, as more sample handling and transit time were needed. Case in point, millions of Americans witnessed the 1995 acquittal of football player OJ Simpson in a televised murder investigation. Blood found on Simpson’s sock matched the victim’s DNA with a certainty of 1 in 21 billion, and a bloodied glove found next to the victim matched Simpson’s blood. However, Simpson was acquitted because the defense argued that forensic evidence had been mishandled. It had not been correctly logged, entered into the chain of custody, bagged appropriately, or analyzed in a timely manner. Heaton knew that shortening the distance and time to sample processing were key to opening the field to broader uses of DNA samples. When Heaton learned about miniPCR, a portable thermal cycler manufactured by Cambridge-based Amplyus, she thought she might have found the ideal solution. “I figured, instead of bringing samples into the lab, why can’t one bring the lab closer to the samples”, says Heaton. The diminutive footprint and weight of miniPCR made it the ideal candidate to test this premise. But there was one catch: Heaton and her team needed to prove that DNA samples amplified with miniPCR could meet the rigorous quality standards of forensic science. Could tiny miniPCR deliver the same performance as 20-times larger rivals? Heaton decided to find out the only way a forensic scientist would: experimentally. Forensic DNA samples are analyzed by examining genetic markers known as short tandem repeats (STRs). STRs are short DNA regions that vary uniquely across individuals. They are the gold standard in personal identification because multiple STRs can be analyzed simultaneously, reducing the probability of a random match to virtually null. The CODIS database managed by the FBI uses 13 different STRs, reducing the chances of spuriously matching two individuals to less than one in one trillion. Genetic databases now offer access to 25 and more loci used in personal ID. To ensure that the fieldable miniPCR machine could study STRs as accurately as benchmark technologies, Signature Science compared results obtained using the miniPCR and the large benchtop AB 9700 thermal cycler. PCR amplicons were separated by capillary electrophoresis and detected in a 3500 xL Genetic Analyzer, and the resulting fluorescence readings were analyzed using GeneMapper ID-X software. Electropherogram plots quantifying the intensity of fluorescence signals (relative fluorescent units, RFUs), a function of the number of copies amplified for each STR by PCR, were compared statistically between miniPCR and the 9700. The results were clear: DNA amplification produced by miniPCR and benchtop PCR machines were essentially identical. 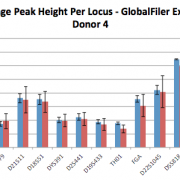 These results held true after analyzing 40 loci from multiple DNA donors using three industry-standard personal ID kits (Global Filer, Global Filer Express, and YFiler, Applied Biosystems). In other words, miniPCR can perform forensic analysis in the field with the same accuracy and precision as much larger PCR equipment can in the lab. * Data used with permission of Signature Science, LLC.